The very first line of Atharva Veda says , "ye trisaptaah pariyanti ...". The meaning of Trisapta here seems somewhat confusing. In the Acharya Vedanta Tirth translation it is called to be the three gunas (satta, rajas, tamas) and seven padarthas (prithvi, jal, tej, vaayu, aakaash, tanmaatraa, ahamkaara). However, the Sankhya philosophy says that the five tanmaatraas are distinct. Moreover, the other translations do not favor this one, they talk about a much vaster meaning - all the possible permutations of 7 and 3. Can anyone please clear me the real meaning? Moreover, is it somehow related to the corresponding devata Vachaspati? Any help is greatly appreciated. The first Sukta of Atharva-Veda is Medha Janan Sukta , Rishi of which is Atharva and Devata is Vachaspati. This is a prayer to Vāchaspati for divine illumination and help. The thrice-seven that go about , bearing all forms - Let the Lord of speech assign to me today their powers [their] selves (tanu). Your main question is about the meaning of the word Tri-Sapta and details about devata vachaspati. William Dwight Whitney who translated Atharva-Veda samhita with a critical and exegetical commentary . Revised and brought nearer to completion and edited by Charles Rockwell Lanman says that. Tri-Saptas is plainly used as designation of an indefinite number ,= 'dozens' or 'scores' supposing shruti to signify one's acquired sacred knowledge , portion of shruti. First he conjectures that it may mean ' three or seven ' ; as the three worlds , the three gunas three highest gods ; or sevan seers , the seven planets , the seven troops od Maruts , the seven worlds , the seven meters or the like. Secondarily , it may mean ' three sevens ' as seven suns (for which is quoted TA. i.7.1) and seven priests and seven Adityas (TA. i.13.3 ; RV. ix.114.3) , or seven rivers , sevan worlds and seven quarters (TB. ii.8.3.) or seven planets ,seven seers and seven marut troops . Thirdly it may signify simply thrice seven or twenty-one as twelve months +five seasons +three worlds +one sun (TS.vii.3.105) or five Mahabhutas +five breaths + five jnanendriyas +five karmendriyas + one antahkarana . At any rate they are the gods ,who are to render aid. The original seven elements in their three forms are everywhere and their flow and transformation is giving shape to this universe. So these are original twenty one elements which are also inside our body , our goal is to maintain harmony of these twenty one elements which are inside to twenty one elements outside to live a healthy life with sound mind power and this is the core topic of Atharva-Veda. Author Shree Ram Sharma Acharya is also saying similarly like William Dwight , he says. The majority of commentators has concluded the meaning of Tri-Sapta as 3*7 =21 . But the view of the seer is much more wider than that. Tri-Sapta can be explained according to permutations maths as 3+7 =10 , 3*7=21 , seven raise to three 343 ,three raise to 729 etc. The seer has written the word Tri-Sapta as one so the meaning of it is all the possible combinations i.e.(Tri-Sapta). On this basis the covers three worlds ,three gunas , three dimensions , three devas etc. In this way there can be infinite permutations and combination are possible and only Vachaspati knows them all. 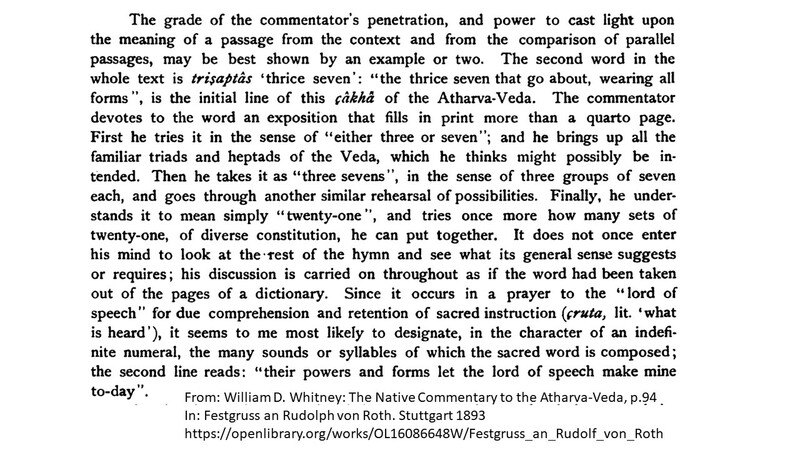 Shree Ram Sharma Acharya in his commentary on first sukta of Atharva-Veda is explaining the meaning of the term in following way. According to him Parabrahman covers all this universe all the time in his unmanifested form (Avyakta अव्यक्त). But when he expresses himself from unmanifested to manifested , then its appropriate to call him "Vachaspati". Shripad Damodar Satwalekar in his commentary " Atharvaveda Subodh Bhashya " is also explaining this devta he is stating that . So from the above two passages the Devata Vachaspati is a good Guru or Supreme Brahman in his manifested form. As the above clip from the Sanskrit scholar William D. Whitney shows, the meaning of "triSapta = 3x7 (Monnier-Williams)" seems not to be a well-defined term. I consider plausible Whitney's conjecture to take "triSapta" as an indefinite numeral. The verse is a prayer to Vacaspati, the god of speech, and opens the whole work. The prayer is followed by a series of hymns. Therefore I do not expect that the verses allude to technical terms from the Indian philosophical schools. Not the answer you're looking for? Browse other questions tagged vedas translation-request atharva-veda .